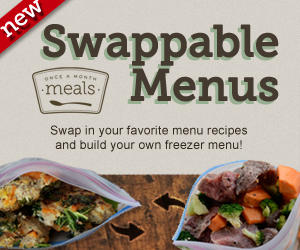 Do you ever have that one dish that everyone asks you to bring to a picnic or potluck? For me, it’s this easy KFC coleslaw dressing recipe. 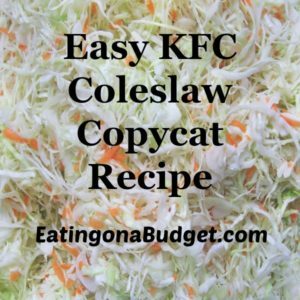 If you like the orignal kfc coleslaw recipe then you have most likely seen plenty of the copycat recipes for it as well. It only takes a few ingredients to make this version of KFC Coleslaw dressing recipe but the that ones I come across all call for buttermilk, which is an ingredient that I never have on hand. Luckily, I found a great substitution for buttermilk and you can’t even tell the difference. I now substitute sour cream for the buttermilk and my copycat KFC coleslaw comes out perfect every time! I always thought that coleslaw and cabbage salad were pretty much the same thing but it depends on who you ask. Coleslaw is typically shredded cabbage with a mayo or oil and vinegar based dressing while cabbage salad often has other ingredients added such as pineapple, apple, grated cheese, etc. There are also different variations from other countries with additions such as dried fruits, nuts, and even meat. Wikipedia shares different variations that I am anxious to try! Back to my copycat KFC coleslaw recipe, I promise that if you make this and take to a picnic or potluck you will be asked for the recipe every time! It is also quick and easy to make, you just need to add a few hours chilling time. I have one confession to make. I know it is more economical to grate the cabbage and carrot but the bags of coleslaw in the produce section of the grocery store tend to be pretty cheap. One day I may invest in a food processor so the job of grating cabbage is easier but for now I will gladly take convenience over grating all that cabbage by hand. 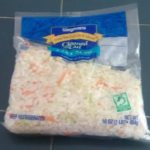 One 16 ounce bag of coleslaw mix can be replaced for about eight cups of grated cabbage and one carrot. If you use two bags double it, three bags triple it and so on. For parties I always take everything in my large Pyrex glass bowl. The largest size holds 4 quarts so I can easily triple my coleslaw recipe for potlucks. 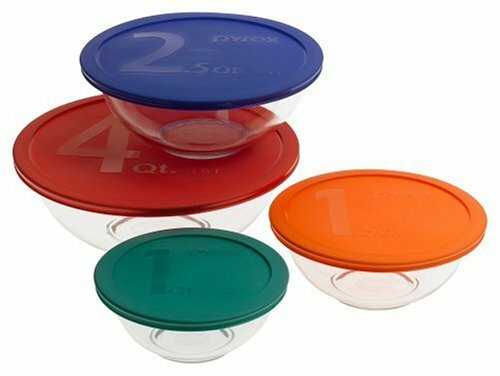 These come with PBA free lids as well to make them easy to transport. For the dressing: In a medium bowl, whisk together everything except the paprika, carrot and cabbage. You can use either fresh squeezed lemon juice or bottled lemon juice but if using bottled be sure to shake well. Place shredded coleslaw mix in a large bowl. Pour dressing over mixture and stir to combine (tongs work great for this). Refrigerate at least three hours before serving. Stir and if desired, sprinkle paprika on top before serving. If you have never made coleslaw before you might think this looks too dry but it wont be. After a few hours in the refrigerator the cabbage will shrivel so it will have more than enough dressing. A 16 ounce bags says it serves about five but keep in mind when you go to a picnic or potluck with a large variety of food, most people take smaller servings. I find that if I double this recipe it feeds about 15 people. I use the dried minced onion found in the spice section at the grocery store but if you don’t have any hand just use a little onion powder (reduce to about 1/4 teaspoon) or fresh minced onion. You can also leave out the onion if desired. I did think about adding the lemon juice to milk but since the recipe already has both lemon juice and milk it felt redundant ;). I also like the creaminess that the sour cream adds. I love coleslaw. I added this to my board of no-cook recipes for summer. Can’t wait to try it! I love the coleslaw from KFC. It is great to have a recipe for it – this will be a favorite this summer!